In the battle for share of consumer time spent with media, TV is losing to digital -- most likely being displaced by over-the-top streaming of video content that previously would have been captured as part of the TV "universe" by Nielsen, but which is now being attributed to digital content consumption instead. 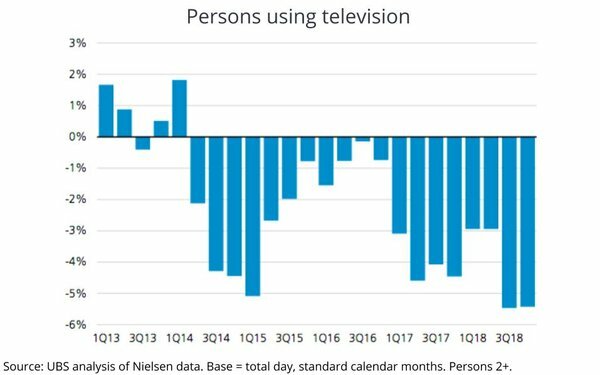 The table above shows the quarterly trend in persons using television (PUT) for viewers two years or older, analyzed by the equities research team at UBS. While TV’s linear usage erosion has been mitigated somewhat by viewers accessing it via Internet-connected devices -- up 42% year-over-year in October, according to a recent analysis by Pivotal Research Group’s Brian Wieser -- there clearly is seepage of audience to other non-TV sources. According to Wieser’s analysis of Nielsen Digital Content Ratings data for the same period, digital content consumed on the major platforms -- Google/YouTube, Facebook, Twitter, Snapchat, etc. -- rose 14% year-over-year.